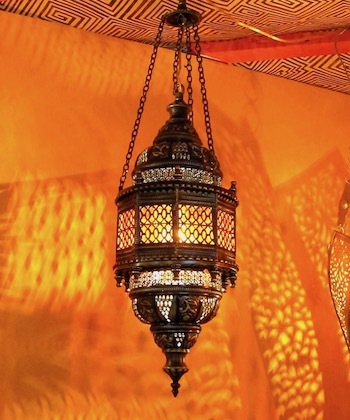 Delicate swirls of floral decoration capped and trimmed with bands of starry metalwork these lanterns could grace a Sultan's palace. 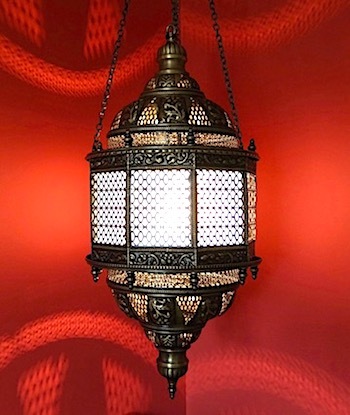 Elegantly and classically styled, these lanterns have the lines of the traditional Damascus lantern. The crown and complementary base are composed of alternating embossed floral and pierced brass panels, trimmed with a circlet of lacework metal. Eight delicate trelliswork windows encase the sumptuously coloured central sleeve. The structure is secured by eight brass rods which are anchored at either end by decorative brass knobs. 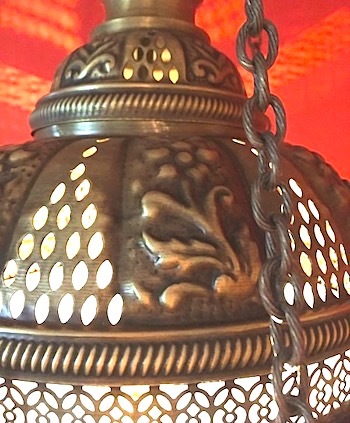 All sizes of the Istanbul Lantern are scaled copies of the same design. The floral panels show tulips, lilies, or sometimes roses. Designed to be easily electrified, the light bulb is accessed by simply lifting the cap to reveal a turned metal rod which connects securely to the light socket. The medium Istanbul Lantern is shown on the left. 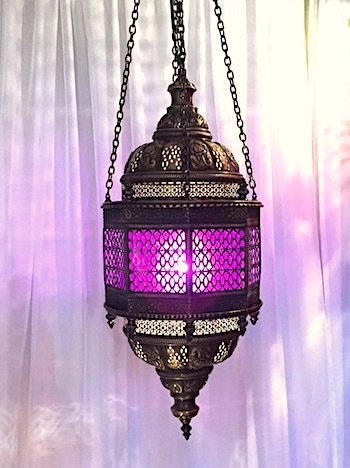 Colours available for both the medium and small lamps: Red, blue, amber, purple and opaque white. The largest of the Istanbul lanterns is shown on the right. Ruby Red, Deep Amber, Frosted White. Taken in the showroom of our factory in Istanbul, this photo shows the large (red) and medium (green) Istanbul classic lamps next to each other to help understand the relative sizes of the lamps. the antiqued brass metal colour.